CHAIR YOGA This gentle practice make yoga accessible to everyone with support of a chair. We do postures that focus on lengthening the muscles while improving our posture and circulation. This practice is perfect for those whom have difficulty standing, limited mobility or sever aches and pains. No yoga mat required. 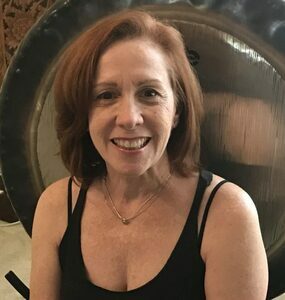 Deep Relaxation Yoga combines restorative yoga (supported postures), gentle yoga, breath work, hands-on-healing and guided meditation techniques. It is an excellent choice for those who need something gentle yet effective for bringing the body into balance and reducing stress. Deep Relaxation is a deeply meditative experience – it provides the opportunity to step away from the busy-ness of the outside world and access the deeper wisdom that resides within us. 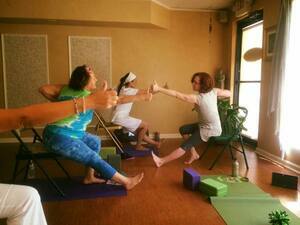 GENTLE HATHA YOGA A calming, stress-relieving yoga class to stretch and strengthen the body gradually. Emphasis is on building awareness of the breath and the body. Asanas are practiced at a slower pace with attention to alignment and detail. HATHA YOGA Hatha Yoga is done on a mat on the floor and uses postures (asana) and stretches in combination with the breath to develop flexibility and relaxation. Hatha Yoga encourages proper alignment of the body and is excellent for increasing flexibility, developing strength, improving body awareness, building concentration and calming the mind. RESTORATIVE YOGA Restorative Yoga uses props (bolsters, blankets, belts, blocks and chairs) to modify traditional yoga poses. These supportive postures gently stretch, and flex the spine in all directions while opening the body to deep relaxation and healing. The class is ideal for those going through stressful times, suffering from chronic pain, illness, cancer, injury or major life changes. YIN Yin postures are passive, done with relaxed muscles and held for several minutes with deep breathing. This allows the body to release tensions and tightness, to enhance energy, cultivate an inward focus and surrender. Explore and nourish the inner layers of the body (joints, connective tissues and organs) and stimulate the flow of chi (prana) through the meridian system. Through inward awareness, we can balance our predominantly outward-focused attention with gentle, compassionate inquiry to what we find in our bodies, minds and hearts. YOGA NIDRA Yoga Nidra (yogic sleep) is a meditation used to bring the subconscious mind to the surface by focusing awareness to the parts of the body in a defined sequence. Participants use a sankalpa, or ‘positive intention’ to direct their path and realize their goals. Yoga Nidra goes well beyond deep relaxation; Yoga Nidra establishes the link between the conscious desires, will power, and the subconscious & unconscious minds. Bring your favorite pillow, blanket and eye pillow and join us for the Sleep of the Yogis.